Welcome to the Village of Union Center! 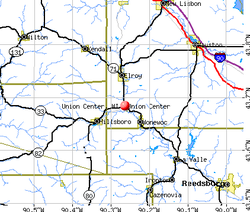 The Village of Union Center is located in the southwest corner of Juneau County. The population of Union Center according to the 2010 Census is right at 200 citizens. The village is positioned on the banks of the scenic Baraboo river and the Wisconsin State Highways of 33, 80, & 82 bisect the village. The Eagle Parkway is situated near the center of the village, right along the 400 State Trail. The trail offers visitors hiking, bicycling and snowmobiling. The Eagle Parkway offers an open shelter for picnics, a playground, volleyball & basketball courts, and horseshoe pits. We invite you to browse all the areas of our village here on our website. If you have any questions about our village, please fill out the contact form below (or use the email link at the top of this home page). Thank you for visiting our site and we hope to see you soon in the Village of Union Center. Please include an email address if you would like a personal reply.